At the 1995 Bass Masters Classic Outdoor Show (Greensboro, NC), BASS provided a booth space to the Memorial Fund so that Bryan’s family could meet and talk to Bryan’s fans. The booth also served as a collection center for donations to the Memorial Fund. The North Carolina BASS Federation provided over 15 volunteers to help man the booth. In preparation for this event, BASS designed the Fund logo, which now headlines our home page, and produced the Memorial Fund Collector Pin. BASS also designed and produced the Memorial Medallion, which was encased in Lucite. 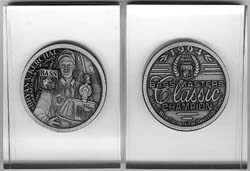 The medallion commemorates Bryan’s 1994 Classic victory. The pins were donated to the Fund by BASS and the medallions were personally donated by Helen Sevier, CEO of BASS. Both items incorporate the BASS logo.